There is no help file for KeyboardState (System Join) or any of the keyboard nodes for that matter. How do I trigger a keyboard press from a vvvv patch? From what I understand I need to connect a KeyboardState (System Join) to a Keyboard (System Global). Then what? I’ve added the key code… do I need to change the time setting?? If I do change the time setting nothing happens. Using W 8.1 and Beta 31.2. Check out KeyboardState (System Join). It would appear that it should be possible to make a key press appear as if it was coming from the keyboard, although the keypress was actually happening from a vvvv patch. 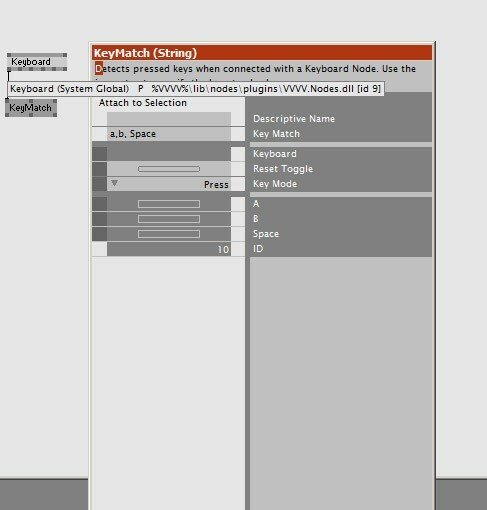 i’ve just added a new node called SendKeyboard (System). to try it check out our alpha builds --(in about 30min)–. it simply takes the new Keyboard datatype and sends whatever comes in to the system. in your case you’d take a KeyEvents (Keyboard Join) node, set the Key Event input to KeyPress, set the desired character on the Key Char input and control the amount of key press events of your virtual keyboard with the bin size pin. update: actually the alpha build is not yet available. i’ll report back as soon as it is. Thanks for looking to this Elias. On a side note Keymatch has a bug with the pin order. If the “Key Match” order is changed, the pin order does not update correctly. See attached patch for an example. Keyboard (System Window) is not detecting the Tab? Keyboard (System Global) detects Tab though. the alpha-build elias was referring to is available now. please put sidenotes in separate threads so we can better keep track of unrelated issues. First of all I don’t know how to use SendKeyboard, because connecting Switches to it doesn’t do anything. Changing EventType manually sometimes brings up the Keys in Keyboard (Devices Desktop) but it’s mostly heavily delayed. But when I can see my Keycodes (18+36) in Keyboard (Devices Desktop), there is ALWAYS the Key 17 (ControlKey) in the spread, too. Why? Loading Home in a Webbrowser is only working with Alt+Home (Pos1) and not Control+Alt+Home. I’m on a Windows 8.1 Touchscreen System. Your need to send LMenu + Home - see my attached patch. Tried and worked in firefox. 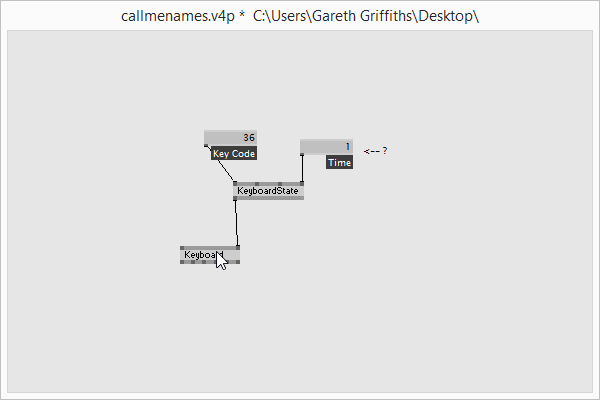 Note that the output of the Keyboard (Devices Desktop) node can be misleading when working with simulated keyboard data. Better use Keyboard (Devices Window).